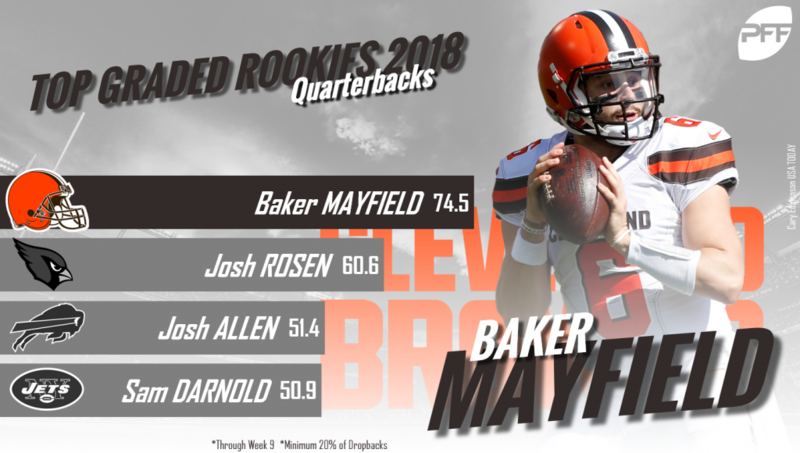 Cleveland Browns quarterback and the number one overall pick in the 2018 NFL draft, Baker Mayfield, had held onto the top spot in the race for PFF’s Rookie of the Year award for five consecutive weeks. However, after a string of sub-par performances, he’s ceded his spot in the pole position. There is still a lot of football left to play and this race is tight as can be, so scroll down the page to see where the rookies stand nine weeks into their careers. Da’Shawn Hand made his debut on the top-10 following Week 2, he climbed into the top-five after Week 7, rose up to second last week, and now, nine weeks into the season, he’s taken the lead in the race for our Rookie of the Year award. Among the 122 interior defenders who’ve logged at least 100 defensive snaps this season, Hand ranks 10th in terms of overall grade, and he’s been a consistent force in the middle of Detroit’s defensive line, earning an overall grade of at least 70.0 in six out of eight games so far. The fourth-round pick ranks 10th among interior defenders with a 12.0% pressure percentage – no other rookie interior defender is even over 9.0% – and he’s also tied for 10th among the position with 13 run stops. The former Alabama star is currently one of just five interior defenders who currently own both a pass rush grade north of 80.0 and a run defense grade of at least 75.0, joining Aaron Donald, Fletcher Cox, Kenny Clark and Geno Atkins. In terms of overall grade, Bates currently ranks fifth among the 99 safeties who’ve seen at least 100 defensive snaps this season, and he’s one of just six safeties who own both a coverage grade of at least 80.0 while also possessing a run defense grade north of 70.0. 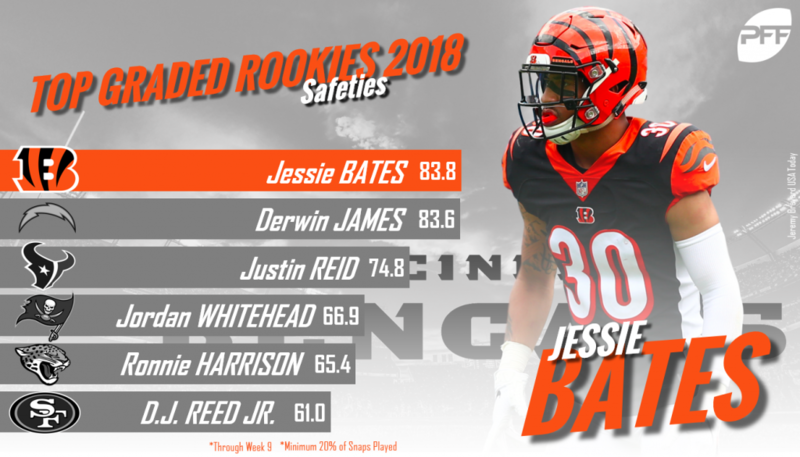 Bates hasn’t had a perfect start to his rookie season (41.6 overall grade in Week 7 against the Kansas City Chiefs), but he’s had some truly elite performances through the first nine weeks, surpassing the 90.0 threshold twice already as a pro. There are 68 safeties league-wide who’ve been targeted at least 10 times as the primary defender in coverage this season, Bates ranks third among that group by surrendering just 59 receiving yards and he leads his peers by allowing just a 19.5 passer rating into his coverage. James dropped out of the top-five in last week’s update, but he’s back in it following a solid performance against the Seattle Seahawks in Week 9. For the season, he ranks seventh among safeties in terms of overall grade and he’s now surpassed the 70.0 threshold in six of eight games to start his career. James has been a swiss army knife for the Chargers all season, lining up at free safety on 201 snaps, as a box safety or linebacker on 182 snaps, in the slot on 75 snaps, and even on the defensive line for 74 snaps. Along with Eddie Jackson and D.J. Swearinger, James is one of just three safeties who currently own a grade north of 75.0 in run defense, coverage and as a pass rusher. He ranks second among all safeties with 11 coverage stops, he’s tied for fifth among safeties with four combined tackles for loss or no gain in run defense and his 36.1% pressure rate ranks first among the 29 safeties who’ve rushed the quarterback at least 10 times this season. Nine weeks into the 2018 regular season and only Bobby Wagner and Luke Kuechly rank ahead of Darius Leonard in terms of overall grade. 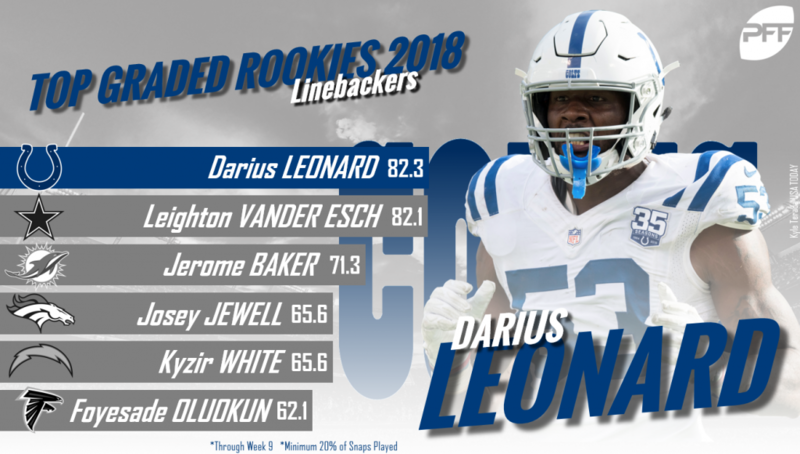 Much has been made about how Leonard leads the league in tackles, but here at PFF, we can go a whole lot deeper than just raw tackle numbers. Through nine weeks, Leonard ranks second among all linebackers with 34 defensive stops and he’s the only linebacker who has at least 24 stops with a missed tackle rate lower than five percent. Mayfield got off to an incredible start to his career, grading north of 81.0 in each of his first three professional games. From Weeks 6-9 though he’s struggled a bit and has failed to grade higher than 62.0 in three of four games over that stretch. Despite the rough patch, Mayfield still ranks 19th among the 41 quarterbacks who’ve seen at least 100 offensive snaps this season in terms of overall grade and he’s one of just seven quarterbacks who own both a passing and rushing grade north of 70.0. The first overall pick is tied for third among QBs with 15 big time throws from a clean pocket and his average of 3.6 yards gained after contact per rush attempt ranks fourth among the 35 signal-callers who have run the ball at least 10 times. McGlinchey’s overall grade of 79.4 currently ranks seventh among the 82 tackles who’ve played at least 100 offensive snaps so far this season, and he’s been a force as a run-blocker, leading the position with an 85.3 run-blocking grade. We’ve already touched on McGlinchey’s dominance thus far as a run blocker, but he’s also greatly improved in pass protection as the season has progressed. 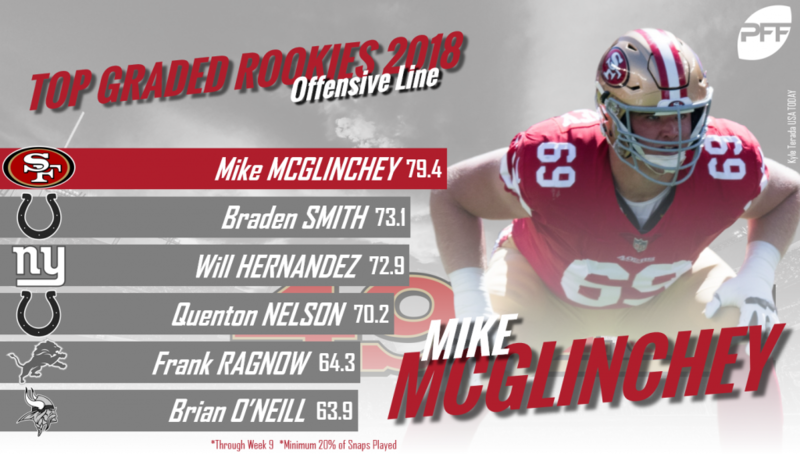 McGlinchey allowed at least two pressures in each of the first four games to start the season, but since then, he’s allowed multiple pressures in just one of five games. Vander Esch – thanks to an electric start to the season – ranks fifth among the 101 linebackers with at least 100 defensive snaps this season. However, his performance has slipped a bit over recent weeks (his three lowest grades of the season have come over the last three weeks), and he has fallen down this list as a result. The first round pick is one of just 14 linebackers to have recorded at least 50 tackles through the first nine weeks of the season and among that group, he ranks third with just a 5.8% missed tackle rate. Alexander currently ranks 11th out of the 128 cornerbacks who’ve been on the field for at least 100 defensive snaps this season in terms of overall grade and his 83.0 coverage grade ranks eighth. The 18th overall pick in this year’s draft currently ranks fifth among cornerbacks with a 27.5% playmaker index (PMI combines forced incompletions and interceptions on a per-target rate) and the 54.7 passer rating he’s allowed into his coverage this season is the fourth-lowest. Among the 128 cornerbacks who’ve played at least 100 defensive snaps so far this season, Ward ranks 13th in terms of overall grade and his 82.4 coverage grade ranks 10th. The fourth overall pick ranks third among all cornerbacks with a combined 14 forced incompletions and interceptions and his nine coverage stops are tied for 13th most among players at the position. To top it off, opposing quarterbacks have just a 70.6 passer rating when targeting him as the primary defender in coverage. Phillip Lindsay just barely edged out Barkley for this spot one week ago, but after a sub-par performance from Lindsay in Week 9, Barkley slides back into our final spot within the top-10. The second overall pick ranks 12th among the 66 qualifying running backs in terms of overall grade and he’s been one of the best receiving backs in football, ranking second among his peers with an 89.6 receiving grade. Barkley is tied for fifth among running backs with an 82.6 elusive rating (E.R. measures the success of a runner with the ball independently of the blocking in front of him by looking at how hard he was to bring down) and he’s one of just six running backs who’ve forced at least 10 tackles as a receiver this season.